More than 1,100 people gathered this past Wednesday night for a memorable and inspiring evening celebrating Israel and community at the Greater Miami Jewish Federation’s 2016 Main Event, and raising more than $650,000 for the Annual Federation/UJA Campaign. 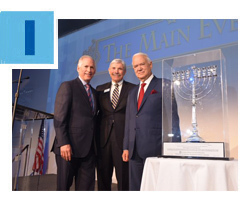 Chaired by Diane and Alan Lieberman, the evening was highlighted by the presentation of the 2016 Friend of Israel Humanitarian Award to George Feldenkreis (left, with Federation Board Chair Robert G. Berrin and President and CEO Jacob Solomon), who spoke passionately about his love for Israel, the United States and the need for unity among the Jewish people. Ambassador Ron Prosor, Israel’s Permanent Representative to the United Nations from 2011 to 2015, delivered an engaging keynote address and the Maccabeats performed several of their top songs. Click here to read excerpts from the speeches. 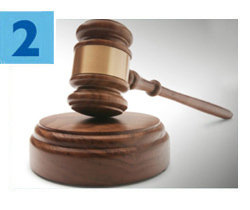 Federation’s Attorneys’ Division will pay tribute to three exceptional judges at the 32nd Annual Judicial Reception, Wednesday, March 9 at Jungle Island. Join us for networking and the presentation of the Lifetime Achievement Award to the Honorable Laurel M. Isicoff, the Community Service Award to the Honorable Michael A. Hanzman, and the Honorable Theodore “Ted” Klein Award to the Honorable Bertila A. Soto. Hilarie Bass, Esq. and Harley Tropin, Esq. are co-chairing the event. For information, contact Emily R. Stone, Esq. at estone@gmjf.org or 786.866.8414. 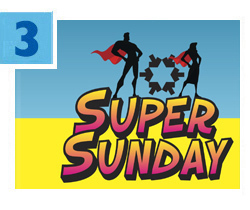 Volunteer and be a COMMUNITY SUPERHERO on Super Sunday – Federation’s largest annual phonathon – and Good Deeds Day, Sunday, March 13 from 9 a.m. to 6 p.m. Join our team of do-gooders and help raise Annual Federation/UJA Campaign dollars to support Jewish needs in Miami, in Israel and worldwide. Do your part for tzedakah (social justice) through activities for all ages! No cape required. Click here for details and to sign up today. 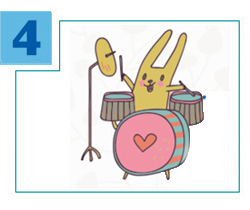 In continuing efforts to share Jewish values and traditions through innovative teaching methods, the Center for the Advancement of Jewish Education (CAJE) and Federation’s PJ Library have embraced ShababaTM, an early childhood learning experience involving music, puppets and play. Join PJ Library for an afternoon of Shababa family fun on Sunday, March 6. Click here for tickets and details. Also, learn what two local teachers have to say about Shababa after attending a recent CAJE-supported workshop in New York. 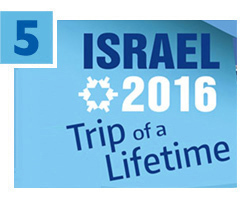 Share the trip of a lifetime next summer on Federation’s Family Mission to Israel, June 16-23, 2016. Experience the beauty and history of our spiritual homeland, enjoy exciting outdoor activities and fascinating private tours, and take part in a special B’nai Mitzvah celebration with your loved ones. Daniel, Iris and Moshe Fujita chair the mission. For details, click here, email Missions@JewishMiami.org or call 786.866.8436.